Tesla CEO Elon Musk just released video showing a Tesla Model X pull 250,000 pounds of muck rail cars out of a tunnel. Yes…250,000 pounds! Musk notes that no surface is perfect for towing and of course it goes without saying that you should never attempt this with your own Model X, but AWD, coupled with powerful electric motors, seems more than capable of tugging heavy loads along. This does make us wonder if the Model X is actually being used as The Boring Company’s heavy hauler. Sort of make sense since it’s electric, which is what’s preferred for tunnel usage. 17 Comments on "Watch Tesla Model X Pull 250,000 Pounds Of Rail Car Out Of A Tunnel"
I’m gonna buy a Model X & Start Boring my own Tunnels , Now that I know That!…Ha Ha ! If you tow 250K lbs with X, you will void the warranty. In fact, I suspect even SparkEV can tow this rail car if not concerned with warranty issue. Tow rating is based on 75 mph highway speeds, and is based on factors like braking and resisting sway at highway speed. Highway tow rating is essentially meaningless at this speed. The phrase “void warranty” is meaningless as you use it too. It doesn’t work that way. Car companies can’t refuse warranty work on an unrelated system, like refusing to fix a faulty radio because you towed beyond the tow rating. Look, we understand this is different than pulling 250,000 lbs of concrete slabs, as the coefficient of friction is very different, but that’s still a lot of weight. Surely you don’t mean Elon Musk. He’s a lot of things, but only okay when it comes to stage craft. The whole point of trains is that it is easy to pull heavy loads on iron (steel) tracks because of very low rolling resistance. There are even people pulling train cars with their teeth! it takes a long time to get going because of the inertia but once you gain speed you don’t need to add much power to keep going. I think the point here is this would be really hard on the transmission of an ICE vehicle because the extreme RPM difference between the engine and the wheels, but in an electric, the motor is also going slow, so the risk of damage is much lower. As long as the acceleration is low, the stress isn’t that high since there are “people” who also demonstrated that they can pull buses, trains or various heavy objects. The so called stress on the transmission is mostly at the torque converter or clutch plate. The engine will be running just above idle and the slip in the torque converter or clutches plate is what will wear out due to heat generated. On electric motor driven gear boxes, the stress on the gears are the same as ICE transmission. There is no clutch or torque converter so it won’t wear out. But high current and low speed operation on electric motors (especially with high slips) will heat up the electric motor significantly as well due to higher copper loss. But that is usually not a big problem as long as the heat is dissipated thru its cooling system (same as ICE). Yeah, this is kind of a stunt. Much easier to pull heavy loads on steel rails than on the road, but I have to admit that now I’m curious as to how a Ford or Chevy pickup would fare with this task. Beyond that, though, I sense that this might represent the opening salvo very public series of towing contests! Let the “War of the Powertrains: ICE vs. Electric” Begin!!! Bring your own fresh air supply if you give it a try. I would hate to be in that tunnel with Ford’s or Chevy’s diesels over-feeding fuel at low rpms at high load. Diesel emissions are very high in that situation. 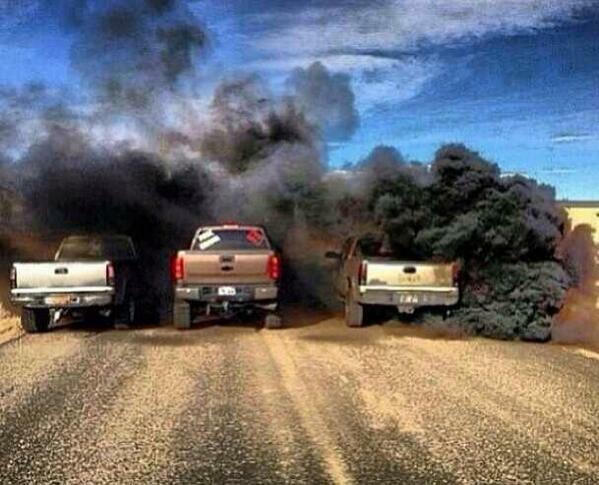 Demanding more fuel is the formula for rollin coal. Yeah… the rolling resistance coefficient is only 0,001 for train wheels. That said, you only need 250 pounds of force to pull this thing. 2-3 persons could pull this thing as well. Your numbers assume totally flat ground. This is at slight grade out of a tunnel underground. We would have to know the grade, but even a slight grade would blow up that number given this weight. For those Diesel guys who said that electric motor can pull only a golf cart, this is the Answer. 250,000 pound is a massive weight. Those rail cars also create quite a bit of aerodynamic drag. Weight isn’t everything, you know.